The Anthus team finally has their own personal geocoin! 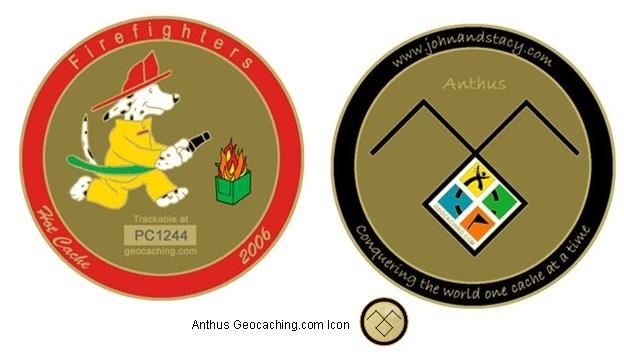 Since Mr. Anthus is a firefighter and many of our friends and family are firefighters, we decided to dedicate our first coin to firefighters worldwide. *Note: Actual S&H costs are determined by the geocoinstore.com. "conquering the world one cache at a time"
PS: For those visiting our web site, I'm in the middle of a masive redesign and hope to have it uploaded within the next couple of days. Cool and nice coin. Thanks for the heads up on the presale date. Hopefully won't go onsale until I get home from work. Cute coin, gotta get a couple How many are you making? And are you up for trades for those of us that may not be around for the sale? Thanx. Just make sure they don't mis-spell your name!! I will have a limited number of these available for trade. This is my first coin and I want to make sure that I sell enough to cover the costs associated with the minting, the tracking numbers, and the custom icon -- given the low selling price of $7. 500 coins will be minted. Only 400 will be sold. The remaining 100 are for me to trade with (and some for me to keep, of course). Would like to trade for 2 of these, one for myself (Team Sand Dollar) and one for my dad (Buffalo Wings). We each have our own coins and they are available in Gold, Silver, or Bronze. I would like to trade with you. Please take a look at my tradiing list. Your coin is very hot. I look forward to hearing from you. Please put me on the trade list, thought I will buy one to make sure I get one. I must have one of these. Very cute. i like to trade to my personal coin! For those wanting to trade, below is a quick list of coins that I am seeking. Please note that I will only have about 50 coins to trade with. The rest will be sold and some will be given to the firefighters of our local fire department. Please contact me via this thread or via email if you have something on my list that you would like to trade with. I'm in the process of getting an offical list together and will post on my personal web site once it is completed. I emailed you about a trade! E-mail sent about a trade. E-mail was rejected by their mail server. It was returned to us. Hopefully they will e-mail us. I just got an update on the Anthus Firefighter Coin. The coin has been posted on the geocoinstore.com web site as an upcoming sale. Orders will be begin on January 27 (I previously stated January 20 but the date has changed). I will edit my earlier posts to reflect the new date. Being a former firefighter/paramedic, I must have 2.
there are different dates for the preorder! In this threat you wrote 20. Jan. on http://www.geocoinstore.com/ there is 27. Jan.
Uups! First reading, then thinking! Does anyone know how I can edit my first message in this thread to change the pre-order date? I don't see an Edit button. Times up. You only can edit prior posts for a certain amount of time/posts. Geocricket, I tried to reply to your email but it bounced back as an unknown address -- even though I used the email you listed in your message. Please send me another email with your email address so I can give it another try. I've gotten many emails today so I'm not sure why it bounced. I will be sending you an email. I see you have been posting on other threads offering to trade your coin. Just thought I would bring this one back up to the top so you would look at it. I am still interested in trading Personal Coins....contact me. Sorry about that. I sent you an email. Are you still interested in a trade for SA green? Yes. I will email you when I get home from work tonight. Being a "current" Firefighter / Paramedic I also Must have 2! Now that's a "hot" coin I too am a professional Fire-Medic and would like to purchase 2 (two) coins. PM'd you cause the emails keep getting rejected! Thanks. Please note that this coin goes on pre-sale on www.geocoinstore.com on January 27. I will post the exact time as soon and I know what it will be.